the act or practice of calling public attention to one’s product, service, need by paid announcements in newspapers and magazines, over radio or television, on billboards, internet etc. : to get more customers by advertising. 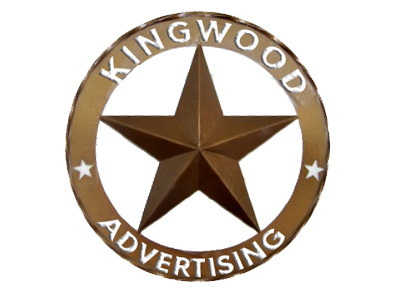 With kingwood Advertising we will help your company market your goods/services to the largest amount of people in your immediate demographic for the least amount of money. Marketing is not rocket science; however, why should you burn your candle at both ends worrying where to spend your marketing dollars when you should be concentrating your knowledge where it’s best served, which is on your business. Allow us to place your marketing and guide you in the right direction. We are experts in the field, and there is no guessing. Why would you spend your company’s hard earned money getting it wrong over and over again when you can simply hire our team at Kingwood Advertising and let us do it right the first time. Marketing your company on Radio, TV, Cable, billboards, and Internet is our specialty. Your goals are our goals. All the full service you’d expect from a mid-size advertising agency. Media planning and buying. Creative development. Strategy and research. And implementation across all forms of media. Our idea of branding is that it is a very important part in the advertising process. Branding is showing people what your company is about, what you believe in, getting your name out to the public is essential to your success. Branding is giving your company an identity for when a consumer hears your name, they know your logo and they know what products and services you offer. These elements identify your brand and create an association that people can identify. We believe that the key to a successful political run is through a well thought out advertising campaign. Our research shows us the key target demographic based on number of registered voters and voting history and identifying special populations that need to be reached. Preparing media plans, negotiating and placing media buys, audit and supervise competitive spending is what we do and it works. This is the fun part – commercial production, Radio or Television allows us to take on the creative roll and when done effectively, a very important way to grow your business. Radio and Television commercials are like cooking, it all works with the right recipe.